It's been over two years since Leema Acoustics introduced its entry level Stream CD player and Pulse amplifier, so it's not surprising that such a technologically savvy company would consider the time right for a revision. What was unexpected is the degree to which they have changed in appearance. Not only do they come in a range of colours, but the Leema Stream III CD player now has a slot in place of a drawer, digital in and outputs (including USB) and a brand new DAC. The Leema Pulse III amp has sprouted an array of digital inputs and an MM/MC phono stage alongside its analogue inputs and is ready for virtually any source you'd care to throw at it. And in true Leema style, both components can be run as one using its LIPS comms bus. The controls have changed, too, instead of regular keys we now have the Navimech, a long name for a circle of five buttons. But why has Leema moved to a III suffix? Apparently there was a Stream II in between this model and the original, so logically this should be Stream III and Pulse II but that makes for confusing marketing, so they are now both III. So what's changed apart from the casework? Well the slot will give you a clue that the disc drive is new and has a new servo to match, this being controlled by custom firmware. It feeds Leema's new Quad DAC which comprises a Wolfson receiver designed to minimise jitter and the company's favoured Crystal CS434x converters. Leema's Mal Nicholls is particularly pleased with this DAC, because its de-jittering skills are applied to all the digital inputs. He reckons that this factor brings the quality available from optical connections in line with those from coaxial ones which are traditionally the best-sounding. The minimalist button array on the player's Navimech is not the most conventional, nor the easiest to use because there are none of the usual symbols to denote functions due to each button being multipurpose. The supplied remote also eschews symbols, but is easier to read. The array of digital connections on the back of the Stream player includes three S/PDIF outputs and one input in coaxial form. It also has a USB output which is something of a rare beast. It's included so that you can make high-quality rips from CD to a PC. Leema recommends Audacity software for this purpose. The Pulse amp also incorporates a DAC, but the USB connection here is the more conventional bi-directional variety that accepts signals from a computer. According to Mal this is not the usual and fashionable asynchronous variety of USB, but the Wolfson receiver does brings jitter down to levels associated with conventional digital connections. It's only limitation is that the Burr-Brown USB receiver only offers a sample rate up to 48kHz. The Pulse III amplifier also has a revised power supply, which is said to offer improved transient current capability. It's still specified as 80 watts (into eight ohms) and nearly double that into four, which is a healthy rating and about par for the price. What is above par is the range of inputs on offer – not only are there the four digital inputs, but there are five analogue inputs as well. Of these, AV direct is a unity gain input for an external AV processor and AUX/MP3 is an either/or shared input between the front and rear sockets which effectively gives you a sixth input. The phono stage, which accepts both MM and MC cartridges, has benefited from refinements trickled down from Leema's Element phono stage. Finally, there are the previously mentioned comms link LIPS connectors, which allows one component to control others in the system. 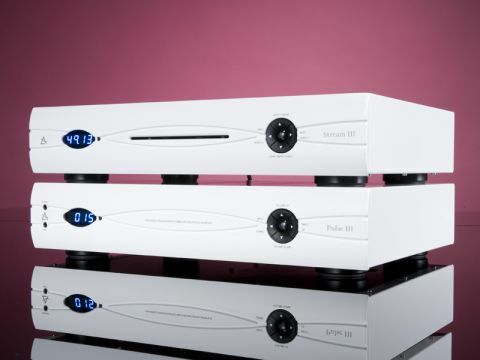 This system allows the Stream to control volume, input selection and on/off in the Pulse. For example, if you are using another input, say tuner, and want to play a CD, simply pressing play will select the CD input on Pulse, set the volume to the default minimum and place the player in play. If you then select another input, the CD will stop automatically. LIPS naturally gets more useful the more Leema components you use. The paint finish was chosen to keep costs down but it makes for a very smart-looking chassis, the sculpted lines and coherence of the controls bringing the two units into strong aesthetic union. The tiny display is not the easiest to interpret, however, because Leema has had to use some unusual abbreviations to fit certain messages in, but the every day ones are pretty clear. What's less useful is that the Stream display will only show elapsed track time and not track number whilst in play. On a long disc especially, the latter would be more useful and we're surprised that there isn't the option to display it. The sheer array of inputs in both number and type is spectacular and should keep the most technophilic enthusiast happy for years to come. The presence of the same DAC in both components means that you can compare the analogue with the digital input from the Stream via the Pulse and this was duly tried. Once we had got used to the way the amp drops volume when changing inputs (a rather irritating 'safety' feature) it became apparent that the two approaches are very close, but that a digital connection made with a good quality Chord Signature cable has the upper hand when it comes to fine detail and bass power. In theory, the analogue connection should be better as the CD player has the better DAC, so cabling could be the key here. Both routes deliver a superbly timed and precisely focused sound that can easily distract from the important business of reviewing. The Stream is a very engaging player, its ergonomics may not be that fabulous, but such foibles are soon forgotten once it has a good disc in its slot. It produces palpable depth and body in the context of an open, transparent presentation that makes the most of fine recordings. Josephine Cronholme's Your Wild Garden is one such piece and the way that her crystalline voice is placed solidly between the speakers is entrancing. The player is precise without being edgy, in fact it's relaxed and natural-sounding and while it doesn't have the dynamic thrills of our more expensive reference its refinement is unusually high. The Pulse has a little more character, inasmuch as its presentation is slightly restrained and a little over-smoothed compared to dearer alternatives. This gives imaging more focus than usual, but also holds back the full scale of the recording's acoustic. On the flipside it means that less refined discs sound just that little bit cleaner, which can be a bonus if your musical tastes are catholic. There's plenty of detail, too, it's presented in a coherent and timely fashion so that the music comes first, but if you want to listen into the mix there's plenty to find. In order to get an idea of how well Leema has executed the USB input, we hooked up a laptop using both USB and TOSLINK optical cables and persuaded the PC to swap between the two. The difference was negligible, whereas the last time we tried this the result was night and day in favour of the TOSLINK connection. The phono stage was also put through its paces with a low-output moving coil cartridge. The gain had to be turned up pretty high, but it delivers a fine, low noise result, nonetheless. We had the opportunity to listen to the Stream in a completely different system and indulged in some of the more challenging selections from Frank Zappa's back catalogue. This further enhanced the impression of musicality that the player gave with its partnering amp, by delivering a well-articulated, invigorating and musically engaging version of events. This pairing looks good, is clearly well made and offers great flexibility in terms of integration with other sources of both hi-fi and computer persuasions. But most importantly it lets the music transport you. Its timing skills, in particular, are very strong and this combined with a polished presentation makes for highly engaging home entertainment. Of the pair the Stream III seems slightly the stronger, but they work extremely well together and this, combined with their range of inputs, helps them raise the bar in this sector.